Yearly meeting place for organizations and volunteers, Octandre will be there to present its activities with a live electroacoutics demonstration. Concert performance in unusual places, with a couple of long-duration experimental music works, by Octandre and Stereotop. Dreams, drones, paintings, narratives, méditations will be there. Come see Octandre on December 14th and on May 19th. Come see Stereotop on October 28th at Espace 29 and in March. One saturday a month, members of Octandre and Stereotop, collective dedicated to experimental sound practices, will meet at the Marché des Douves to share their works and discuss aesthetic and technical issues. Usually only for members of these groups, the sessions will be open to the public, specialists and novices alike, every third month, to allow for a discussion with the artists. Public sessions on December 16th, March 10th & June 16th. Proxima Centauri invites Octandre for three Saturdays of discovery of electroacoustic and acousmatic music. A trip to the universe of sounds. SPOT ¡ musiques aujourd’hui ! is a surprising formula, strongly engaged towards new music. On Saturday at 12pm, musicians will be in the Marché des Douves for a 20-minutes concert, discovering contemporary creation. Come see Octandre on November 25th, March 3rd & April 7th. Come see Proxima Centauri on October 14th, January 20th & May 5th. This season opens with an acousmatic concert about pleasure and ecstasy, where members of Octandre will present a specially composed work. With the support of Scrime / Université de Bordeaux. For the Semaine du Son from Monday, January 22nd to Sunday, February 4th 2018, the Scrime invites Octandre to present the music of two of its members, Ola Ziolkowska and Cyril Gourvat, for a “concert-meeting”. Animated by Edgar Nicouleau, they will perform their music and talk with the audience. Salle Hémicyclia, LaBRI (bât A30), Université de Bordeaux / Talence. 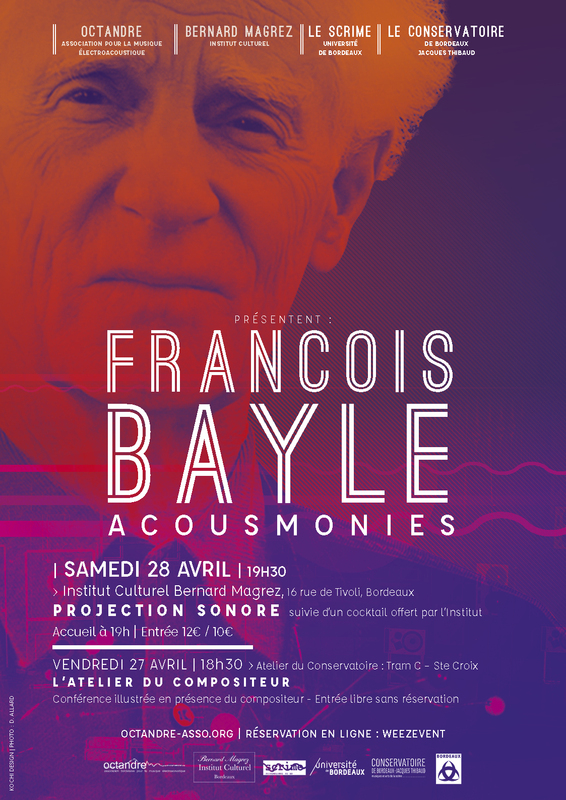 This season, François Bayle, former director of the GRM in Paris and honorary member of Octandre, is invited in Bordeaux to talk about his music during a Composer’s Workshop in the Conservatoire de Bordeaux, before giving a monographic acousmatic concert.